The Landing at Kip’s Bay was a British amphibious landing during the New York Campaign in the American Revolutionary War on September 15, 1776, occurring on the eastern shore of present-day Manhattan. 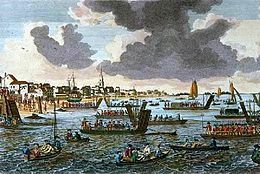 Heavy advance fire from British naval forces in the East River caused the inexperienced militia guarding the landing area to flee, making it possible for the British to land unopposed at Kip’s Bay. Skirmishes in the aftermath of the landing resulted in the British capture of some of those militia. British maneuvers following the landing very nearly cut off the escape route of some Continental Army forces stationed further southeast on the island. The flight of American troops was so rapid that George Washington, who was attempting to rally them, was left exposed dangerously close to British lines. 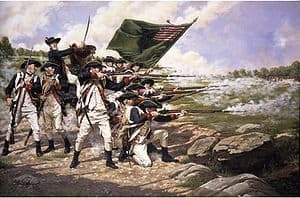 The operation was a decisive British success, and resulted in the withdrawal of the Continental Army to Harlem Heights, ceding control of New York City on the lower half of the island. The following day, however, the British and American troops fought the Battle of Harlem Heights, which resulted in an American victory. The American Revolutionary War had not gone well for the British military in 1775 and early 1776. At besieged Boston, the arrival of heavy guns for the Continental Army camp prompted General William Howe to withdraw from Boston to Halifax, Nova Scotia in March 1776. He regrouped there, acquired supplies and reinforcements, and embarked in June on a campaign to gain control of New York City. Anticipating that the British would next attack New York, General George Washington moved his army there to assist General Putnam in the defensive preparations, a task complicated by the large number of potential landing sites for a British force. Howe’s troops began an unopposed landing on Staten Island in early July, and made another unopposed landing on Long Island, where Washington’s Continental Army had organized significant defenses, on August 22. On August 27, Howe successfully flanked Washington’s defenses in the Battle of Long Island, leaving Washington in a precarious position on the narrow Brooklyn Heights, with the British Army in front and the East River behind him. On the night of August 29–30, Washington successfully evacuated his entire army of 9,000 troops to York Island (as Manhattan was then known). Despite showing discipline and unity during the evacuation, the army quickly devolved in despair and anger. Large numbers of militia, many of whose summertime enlistments ending in August, departed for home. Leadership was questioned in the ranks, with soldiers openly wishing for the return of the colorful and charismatic General Charles Lee. Washington sent a missive to the Second Continental Congress in Philadelphia asking for some direction—specifically, if New York City, which then occupied only the southern tip of Manhattan Island, should be abandoned and burned to the ground. “They would derive great conveniences from it, on the one hand, and much property would be destroyed on the other,” Washington wrote. York Island was occupied principally on the southern tip (what would now be considered Lower Manhattan) by New York City, on the western tip by Greenwich village, and in the north by the village of Harlem. The sparsely-populated center of the island featured a few low hills, principally Indianburg and Crown Heights. Ferry services connected the island to the surrounding lands, with the primary ferry to the mainland of Westchester County (now the Bronx) crossing the Harlem River at King’s Bridge near the northern tip of the island. The island was bordered by two rivers, on the west by the Hudson River and on the east by the East River, which separated the island from Long Island. Kip’s Bay was a cove on the eastern shore of the island, extending roughly from present-day 32nd to 38th Streets, and as far west as Second Avenue. The bay no longer exists as such, having been filled in, but in 1776, it provided an excellent place for an amphibious landing: deep water close to the shore, and a large meadow for mustering landed troops. Opposite the bay on Long Island, the wide mouth of Newtown Creek, also surrounded by meadowlands, offered an equally excellent staging area. Washington, uncertain of General Howe’s next step, spread his troops thinly along the shores of York Island and the Westchester shore, and actively sought intelligence that would yield clues to Howe’s plans. He also ordered an attempt to be made on HMS Eagle, the flagship of General Howe’s brother and commander of the Royal Navy at New York, Admiral Richard Howe. On September 7, in the first documented case of submarine warfare, Sergeant Ezra Lee, volunteered to pilot the submersible Turtle to the Eagle and attach explosives to the ship; the submersible’s drill struck an iron band it could not penetrate, and Lee was unable to attach the required explosives. Lee was able to escape, although he was forced to release his explosive payload to fend of small boats sent by the British to investigate when he surfaced to orient himself. The payload exploded harmlessly in the East River. Meanwhile, British troops, led by General Howe, were moving north up the east shore of the East River, towards King’s Bridge. During the night of September 3 the British frigate Rose, took advantage of a north-flowing tide and, towing thirty flatboats, moved up the East River and anchored in the mouth of Newtown Creek. The next day, more transports and flatboats moved up the East River. Three warships—HMS Renown, HMS Repulse and HMS Pearl—along with the schooner HMS Tryal, sailed into the Hudson. On September 5, General Nathanael Greene, recently returned to duty from a serious illness, sent Washington a letter urging an immediate withdrawal from New York. Without possession of Long Island, Greene argued, New York City could not be held. With the army scattered in encampments on York Island, the Americans would not be able to stop a British attack. Another decisive defeat, he argued, would be catastrophic with regard to the loss of men and the damage to morale. He also recommended burning the city; once the British had control, it could never be recovered without a comparable or superior naval force. There was no American benefit to preserving New York City, Greene summarized, and recommended that Washington convene a war council. By the time the council was gathered on September 7, however, a letter had arrived from John Hancock stating Congress’s resolution that although New York should not be destroyed, Washington was not required to defend it. Congress had also decided to send a three-man delegation to confer with Lord Howe — John Adams, Benjamin Franklin, and Edward Rutledge. On September 10, British troops moved from Long Island to occupy Montresor’s Island, a small island at the mouth of the Harlem River. One day later, on September 11, the Congressional delegation arrived on Staten Island and met with Admiral Lord Howe for several hours. The meeting came to nothing, as Lord Howe was not authorized to grant terms the Congressional delegation insisted on. It did, however, postpone the impending British attack, allowing Washington more time to decide if and where to confront the enemy. In a September 12 war council, Washington and his generals made the decision to abandon New York City. Four thousand Continentals under General Israel Putnam remained to defend the city and lower Manhattan while the main army moved north to Harlem and King’s Bridge. On the afternoon of September 13, major British movement started as the warships Roebuck and Phoenix, along with the frigates Orpheus and Carysfort, moved up the East River and anchored in Bushwick Creek, carrying 148 total cannons and accompanied by six troop transport ships. By September 14 the Americans were urgently moving stores of ammunition and other materiel, along with American sick, to Orangetown, New York. Every available horse and wagon was employed in what Joseph Reed described as a “grand military exertion”. Scouts reported movement in the British army camps but Washington was still uncertain where the British would strike. Late that afternoon, most of the American army had moved north to King’s Bridge and Harlem Heights, and Washington followed that night. General Howe had originally planned a landing for September 13, recalling the date of James Wolfe’s key landing before the Battle of the Plains of Abraham in 1759. He and General Clinton disagreed on the point of attack, with Clinton arguing that a landing at King’s Bridge would have cut Washington off once and for all. Howe originally wanted to make two landings, one at Kip’s Bay and another at Horn’s Hook, further north on the eastern shore, but struck the latter option when ship’s pilots warned of the dangerous waters of the Hell Gate, where the Harlem River and waters of Long Island Sound meet the East River. After delays due to unfavorable winds, the landing, targeted for Kip’s Bay, began on the morning of September 15.
he Hessians shot or bayoneted a number of American troops who were trying to surrender. Two thousand Continental Army troops under the command of Generals Samuel Parsons and John Fellows arrived from the north, but at the sight of the chaotic militia retreat, they also turned and fled. 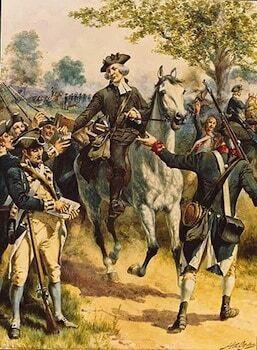 Washington, still in a rage, rode within a hundred yards of the enemy before his aides managed to get him off the field. More and more British soldiers came ashore, including light infantry, grenadiers, and Hessian Jägers. They spread out, advancing in several directions. By late afternoon another 9,000 British troops had landed at Kip’s Bay, and Howe had sent a brigade toward New York City, officially taking possession. While most of the Americans managed to escape to the north, not all got away. “I saw a Hessian sever a rebel’s head from his body and clap it on a pole in the entrenchments,” recorded a British officer. The southern advance pushed for a half mile (0.8 km) to Watts farm (near present-day 23rd Street) before meeting stiff American resistance. The northern advance stopped at the Inclenberg (now Murray Hill, a rise west of Kip’s Bay), just west of the present Lexington Avenue, under orders from General Howe to wait for the rest of the invading force. This was extremely fortunate for the thousands of American troops south of the invasion point. Had Clinton continued west to the Hudson he would have cut off General Putnam’s troops, nearly one third of Washington’s forces, from the main army, trapping them in lower Manhattan. The British were welcomed by the remaining New York City population, pulling down the Continental Army flag and raising the Union Flag. Howe, who had wanted to capture New York quickly and with minimal bloodshed, considered the invasion a complete success. Not wanting to continue battling with the Americans that day, Howe stopped his troops short of Harlem. Washington was extremely angry with his troops’ conduct, calling their actions “shameful” and “scandalous”. The Connecticut militia, who already had a poor reputation, were labeled cowards and held to blame for the rout. However, others were more circumspect, such as General William Heath, who said, “The wounds received on Long Island were yet bleeding; and the officers, if not the men, knew that the city was not to be defended.” If the Connecticut men would have stayed to defend York Island under the withering cannon fire and in the face of overwhelming force, they would have been annihilated. The next day, September 16, the two armies fought the Battle of Harlem Heights.